On Monday, Turkish President Recep Tayyip Erdogan opened the new Istanbul Airport, a major public works project that is the culmination of Erdogan’s 15-year building spree. At the price of $11.7 billion, the new Istanbul Airport will be one of the world’s busiest. At a price of $11.7 billion, the new Istanbul airport will be one of the world’s busiest. The new Istanbul Airport was constructed and will be operated by iGA, a joint-venture consortium that was awarded a contract in 2013 and will be continually improving upon the airport over 25 years, according to iGA’s website. 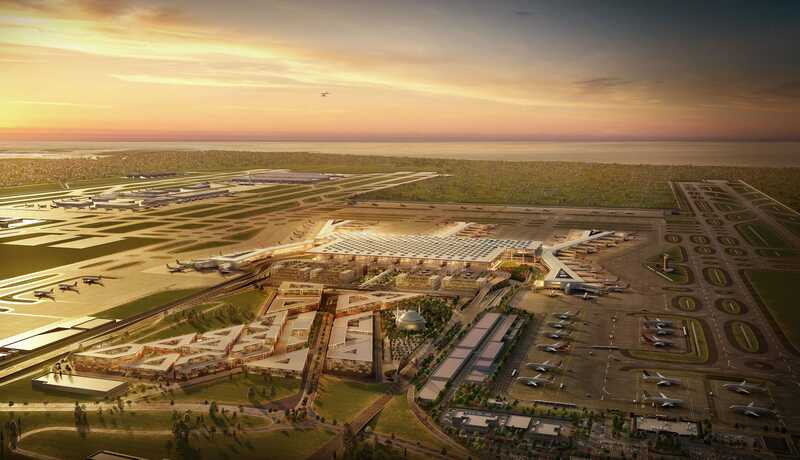 iGA anticipates the new Istanbul Airport to serve more than 100 airline companies and reach over 300 destinations, though it is unclear if these numbers account for the entire score of the project. iGA, who developed the project, expects the airport to serve 90 million passengers in the first phase of construction, and anticipates that number to rise to 200 million passengers in three terminals once the fourth phase is completed. With phase one of the project completed this week, iGA expects all four phases to be completed between 2025 and 2027, when the airport plans to become „a new center of international aviation,“ as the Board of Directors wrote in a public letter. The airport will utilize some of the newest technology emerging in a variety of sectors. According to iGA, information technology solutions featured at the airport will include BIM (Building Information Modelling), virtual reality, augmented reality, smart kiosks, and social media enabled services. Take a look at some photos and renderings below which showcase the inauguration ceremony of the new Istanbul Airport as well as some interior and exterior shots. Turkey’s President Recep Tayyip Erdogan held a ceremony on October 29, 2018 to inaugurate the opening of the new Istanbul Airport. The airport cost $11.7 billion to build and is the largest public works project in Turkey’s history.